As debate continues to grow around the digital buying practices of the world’s big media agencies, a group of former holding company staff have launched what that they claim will be “entirely transparent” independent agency. 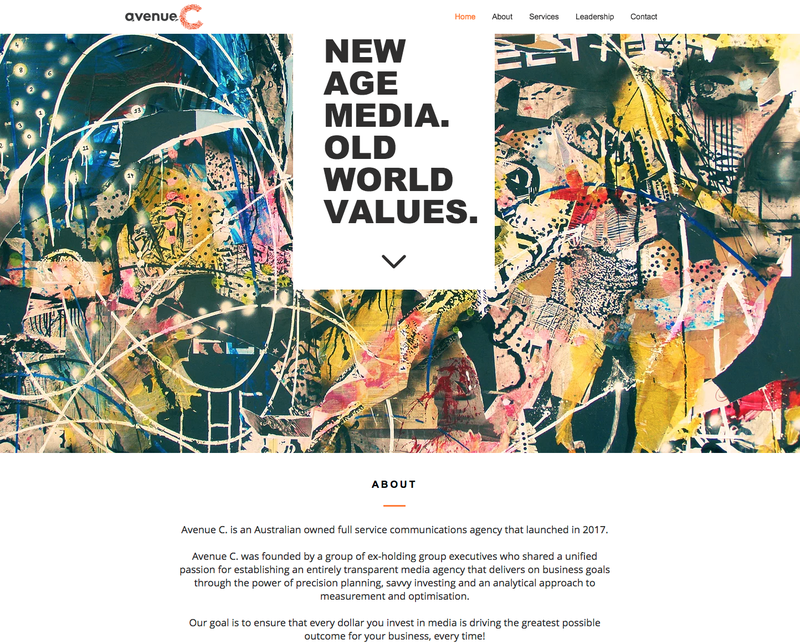 Avenue C will be run by former IPG Mediabrands group operations business director Hugo Cutrone and Ansible Australia’s former client advisory and partnerships lead William Chapman. As well as offering agency services, Avenue C is also offering to help brands review the performance of their existing agencies and check contracts to ensure they are not written to the benefit of the agency rather than the client. A third offering at the Sydney based agency will help brands develop technology. “Our goal is to ensure that every dollar you invest in media is driving the greatest possible outcome for your business, every time,” the site adds. Cutrone departed IPG Mediabrands last month following a major restructure which saw the departure of chief operating officer Dan Johns and three other executives. The former group operations business director joined the agency in April 2015 and spent over two years in the role. Before joining IPG, Cutrone was the managing partner of client advice at Ensemble Australia for seven months after departing UM as group director in 2015. Chapman also departed mobile and technology business Ansible Australia in September after almost two years in the role. Prior to his stint at Ansible, Chapman was the director of brand marketing at Walden Farms International for a year. Advisory and review of your agency team to ensure the team is structured to deliver on your business objectives. Advisory and review of your agency planning, buying and performance capabilities for all levels of media investment. ​Advisory and review of your agency contracts to ensure they are structured around your business goals, not theirs. Cutrone is not the first agency executive to depart Mediabrands and launch an offer to help clients navigate the murky world of digital media buying. Former IPG Mediabrands head of technology Andrew Hughes has since launched “independent, transparent and agnostic” consultancy Louder which helps “marketers to get a neutral view of the world due to many stakeholders in the landscape having severe conflicts of interest”. Both Cutrone and Chapman told Mumbrella it was too early to publicly discuss the launch of the agency. A media agency offering to review the suitability of client’s contracts with other media agencies? Can’t see an issue with that. Excellent news. Slingshot has often felt lonely being an independent and entirely transparent media agency in this market for 9 years. It might be nice to have some company. You’ll find Mindbox has been doing it since 2000. I recall Andrew Hughes touting the transparency story in the past as a tech business implementing solutions only. Why trust Avenue C staff after both coming from roles infamous for not being transparent (edited by Mumbrella for legal reasons). This jumping on the transparency band wagon is so #yawn and predictable. Where were all these pioneers of honesty and integrity 3 or 4 years ago when they sat silent in their roles on the other side of the fence. I can see the advertisement now: “Bergen-Belsen: putting people first”. the analogy of Concentration Camp Guards…..you sir / madam are a world class prat. Hugo, Will – congratulations & good luck with your venture. I am sure that you will fly! Your turn of phrase in the rest of your comment is horrific, and appalls me. c) those who require Louder to provide the platform, we do – as a separate, data silo’d, client owned seat. That client has full access to the buying technology, where they can buy media through that solution, and can choose to leverage Louder’s publisher relationships, or as a number do, they can deal with publishers directly themselves. Should, at any point “value” or “rebate” or any incentive be derived as a consequences of our work either on a clients or Louder’s platforms is converted to a service hours credit immediately. – generally marking up or arbitraging technology or services would be. Louder has positioned to ensure that clients DO get that independent and objective service without the clandestine payments. As I have said previously in response to another comment on Mumbrella; The transparent commercial model is one that I operated in the UK from 2001-2006 with a previous business, and isn’t “new” to us. I applaud another commenter in here – Corbs for continuing to fight the good fight for transparency. We approve of this message as they say. Louder are, and will continue to be a services business, and are remunerated on an fully accountable hourly or effort basis. The fact that we provide *some* of our clients with platforms, through which *they* buy media is the delivery of technology rates comparable to a Global Agency Group, and better pricing of media through our publisher relationships, which delivers MORE value to clients. We think this is the right way to do business, and our growing client base seems to corroborate this ethos. Ps. Should you wish to discuss it further, I’m available through the contact form on our website linked above. Very well put Andrew. Not that you needed to clarify your position. As you say, you guys are very vocal and clear on your stance on transparency and client remuneration. You’re doing fantastic work in market…keep up the good fight. These guys are great operators and really know their stuff, looking forward to seeing big things! good luck boys! 2 of the best! 2 seriously clever guys. All the best! Start with the clients of small media agencies in Sydney that claim to get the best rates for their clients! Tell them to ask for media receipts! You will be inundated with new business. Good luck fellas. With the talent you’ve found combined with a clear direction, success is inevitable. Jump aboard.